This undated handout photo released by the University of Alberta shows the skeleton of the Tyrannosaurus rex "Scotty" at the T.rex Discovery Centre in Eastend, Canada. Nicknamed Scotty for a celebratory bottle of scotch consumed the night it was discovered, the T. rex was 13 metres long and probably weighed more than 8,800 kilos, making it bigger than all other carnivorous dinosaurs, the team from the University of Alberta said. "This is the rex of rexes," said Scott Persons, lead author of the study and postdoctoral researcher in the Department of Biological Sciences. "There is considerable size variability among Tyrannosaurus. Some individuals were lankier than others and some were more robust. Scotty exemplifies the robust," Persons said. While the giant carnivore's skeleton was discovered in 1991, paleontologists spent more than a decade just removing the hard sandstone that covered its bones. "Scotty is the oldest T. rex known," having lived into its 30s, Persons said. "By Tyrannosaurus standards, it had an unusually long life. And it was a violent one," Persons said. "Riddled across the skeleton are pathologies -- spots where scarred bone records large injuries." 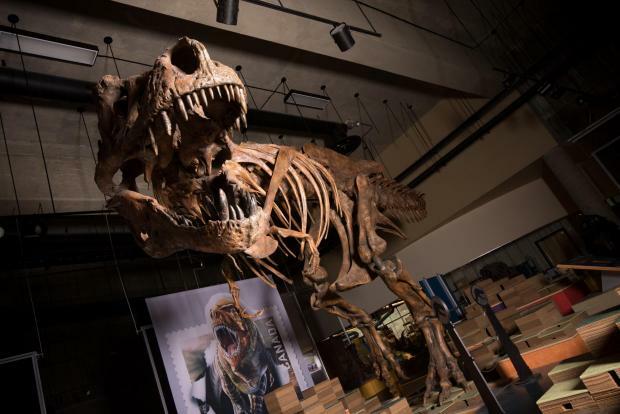 An exhibit featuring the dinosaur's bones is to open in May at the Royal Saskatchewan Museum.